Vacation rental house. Sleeps 20, 10 bedrooms, 8.5 bathrooms. No pets allowed. Mr. Webster tells us that a lair is a secret retreat or a base of operations...a hideaway. Well, that pretty well describes it. The mighty Mountain Lair with its 10 bedrooms comfortably sleeping 20 is the perfect place to rally the troops on your next mountain retreat. Inside there is something for everyone with 10 TV's, a pool table and bar, free WIFI, DVD players , 2 fireplaces, and no less than 3 laundry centers! 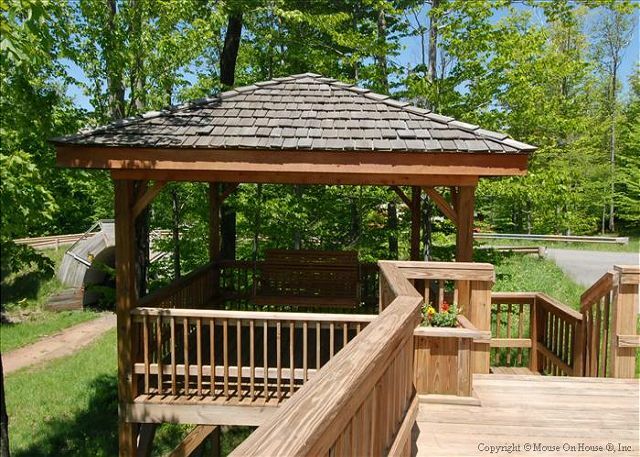 Visitors in spring, summer and fall will love taking the festivities outside to enjoy dining on the deck or relaxing under one of the gazebos with family and friends. This is the perfect place to plan a family reunion or weekend warrior getaway. My family planned a reunion and wanted to be in Canaan to enjoy the breathtaking views and freah air. We had a great stay in the Mountain Lair! Plenty of room and everything we needed was in the beautiful kitchen. Best of Canaan staff answered all our questions and were very accommodating. We are thankful for a wonderful time- this was the greatest idea for a family reunion!!! I definitely recommend this property and we will definitely be back!!! a guest from Stuarts Draft, VA does not recommend this vacation rental. Great house but is no longer slopeside. There is no ski slope anymore. Please adjusts your rental rates accordingly. Not sure what to say. Mountain Lair is still a great 10 bedroom house that comfortably sleeps 20 people. We appreciate great customers like you and surely hope you visit again. We always enjoy our stay at Mountainlair! A good time was had by all. Two rainy days but everyone found something to occupy themselves with! Great party house. Had Friday evening reception there. All had a great time. Rented again for next year. Excellent, superb, fantastic. We’ve been trying to get this house for years, it was always unavailable our week. the house was perfect for our church group, it had just the right amount of room for our needs plus space for those who needed some alone time. This was our 7th trip to this home. We always have a wonderful time. The weather this year was rainy but Saturday was nice. It was nice that the ice maker was working this year. We grilled out but only one grill was usable and that was after a very good cleaning which took a long time. I can't believe that the renters leave the grills so bad. Last year both grills didn't work so I know the owner purchased a new grill but it was a mess and the other one was broke. The home was very clean and we do really enjoyed our stay. We will be returning next year. This house has 6 master bedrooms! 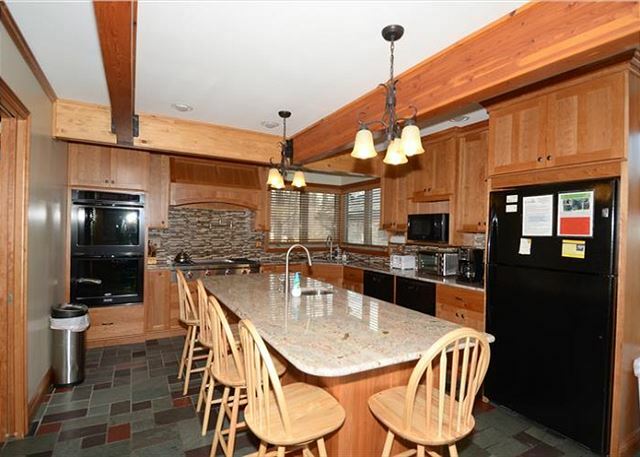 The kitchen is great for large gatherings. Location is great. 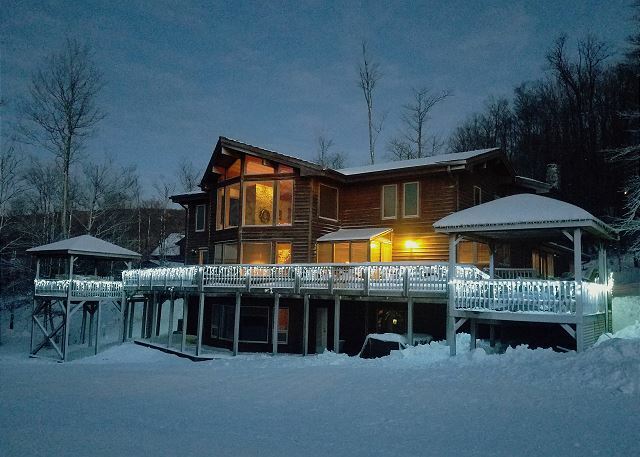 We have been renting this home for years and believe it is the best slopeside home! We had a large family get away for our extended family in December. Ages ranged from 7 months to 80 years old. Fun was had by all. Our only complaint is that the basement was a little cold for sleeping (we will be sure to bring heaters next time). The bed in the handicap bedroom was very high, which made it difficult for my grandfather to get in and out of bed. It was very clean & upgraded. This home is ideal for a large group in a beautiful setting and the weather was perfect for the week that we were there. It is really nice that most bedrooms have there own adjoining bathrooms. Every one had a good time and enjoyed their stay. Beautiful place for a family of 20 adults, kids, and grandkids. All have their space. Just need less rain and a hot tub for 20! We were 13 adults and 3 kids that came here for a family reunion and it was perfect for our needs. Plenty of bedrooms for all and spacious enough that we weren't tripping over each other. Very clean and well taken care of. Plan on returning again in 2 years as next year has already been booked elsewhere. We enjoyed the waterfalls and a picnic at Blackwater Falls Park otherwise just stayed at the house the entire time. The only minor complaint would be they need retractable shades on overhead window over the dining table as the sun was in our eyes as we were eating dinner. the house was perfect for our group. need some blinds on the windows above the dining table. Perfect home for large family! We stayed at Mountain Lair for my nephew's wedding and had a wonderful stay! 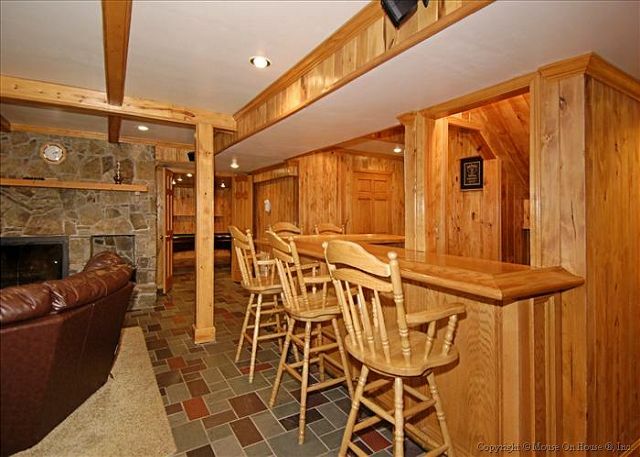 It was large for our big crowd, it had a super kitchen, great hot tub and deck. I could go on and on! We loved it! We have stayed here 5 years now every June. It is a great house and easily accommodates the group. Arrived early, and the ladies at the Rental office were helpful in contacting the house to see if we can place items in the fridge and freezer before we golfed. When we arrived we met the owner, and he also was very accommodating to our needs. The cleaning personnel were also helpful, and just made our arrival convenient and less stressful. Thanks to All! We have been staying at this house for several years as our annual ski weekend. the house is perfect plenty of room so you don't feel like you're on top of each other. The kitchen has everything you need for a large crowd. Access to the slopes couldn't be better. Beds are comfortable. House is clean and well cared for. Everyone at the realty company has bee friendly and helpful. Unfortunately, the ski resort has been looking old and tired. Ski conditions have not been the best. Our crowd has dwindled so we will be giving up the house for next year. This is a beautiful home in a great location. The house was well furnished. 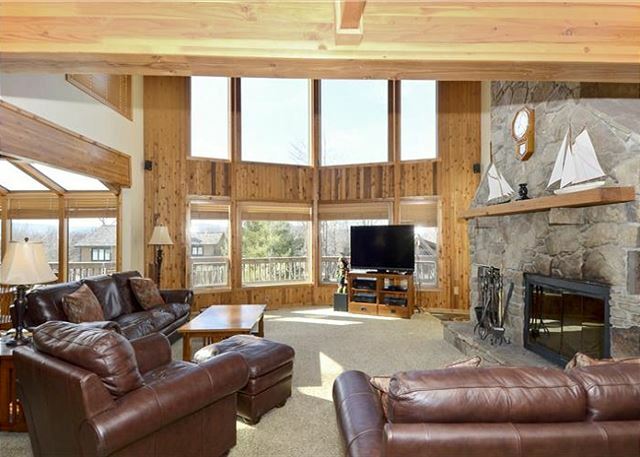 The spacious floor plan can accommodate large groups while still offering plenty of privacy. We have stayed in this rental house for Thanksgiving for many years. This house accommodates our family (15+)very, very well. Over the years the house has had several renovations, including enlarging and remodeling the kitchen/dining area, and adding many bedrooms and bathrooms. We very much enjoy our vacations here, and hope to spend many more Thanksgivings here! I gave a 4-star evaluation of the general condition because one of the dishwashers was not functioning. Lovely home. Perfectly equipped kitchen. Spacious deck. I cannot think of a negative comment! This is the 5th year we rented this property for a week long family reunion and it is still a great place to stay. The upgrades to the kitchen are excellent. We all had a great time. The house is beautiful and well stocked. The people at Best of Canaan are very friendly and helpful. We spent a week with our extended family of 16 adults and kids at Mountain Lair. It was a great house and location for our family. The house provides really nice communal space and lots of rooms and nooks to have some alone time as well. The house was very clean and we really enjoyed the kitchen - spacious and well-appointed. We loved the location. The neighborhood has a clean pond for swimming, tennis courts, and lots of trails. And there are so many fun things to do in the Canaan Valley region. the house was really great! Having 2 refrigerators, 2 dish washers and 2 oven were a big plus!!! it was nice to have a somewhat sound proof house. Too bad we had some rainy days but even with the house full it never seem crowded. 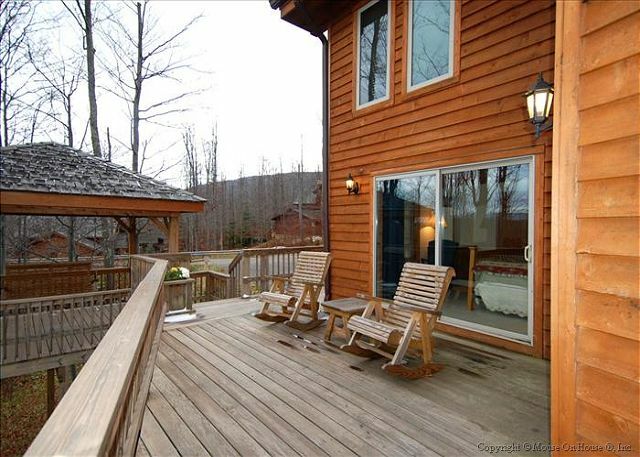 love the rocking chairs on the deck!! We have discovered a new tradition! After many years of staying over 10 miles away in an eight-bedroom house, we now will be annually staying slope side in Mountain Lair! Granted it is more costly to rent, but the convenience, accommodations, etc. were well worth it for everyone in our group. The only drawback was the small parking lot. But once everyone arrived, including one couple from Florida, nobody needed their vehicle until we were leaving on Sunday. There is a parking lot close by for the extras. Like I said in the title, "Great Place!! Great Time!!" Everyone is looking forward to returning to our new location next year!! We have been renting this house for about 4 years now. We always enjoy our stay. The house is big enough that you don't feel like you're on top of one another. The kitchen is well stocked with enough dishes, pots, silverware and glasses for our large group. Love the two ovens, two dishwasher. We just wish the hot tub was a little bigger. It's a perfect place to stay with family and friends. Winterset 31 we have stayed in the past 6-8 years. The updated kitchen is fantastic for a large group. The snow has been poor the past several years so we are not going to repeat this weekend. We did however go visit Black Water Falls since the weather was so mild and we really enjoyed that. We all had a great time there was more than enough room for everybody.Kitchen also great. Overall Mountain Lair is a very nice and huge property. During the first part of the week we had almost 20 people and everyone had plenty of space. Everything was very clean. 1. The kitchen was wonderful. Plenty of everything. 2. They had the best hot tub I have ever seen at a rental property. It got a lot of use and worked great. it even had a built in radio. 3. The electronic equipment throughout the house was excellent. They even had Blu-ray players connected to most of the TVs. 4. The huge porch and porch furniture was very nice. 1. The Internet connection was really bad. It would come and go and sometimes not work for long periods of time. 2. There were ants in the kitchen. Not a lot but enough to bother some of the ladies. 3. The satellite TV service was very spotty at times. It did not take much cloud cover to mess up reception. 4. We had problems with the two upstairs toilets. It did not take much to stop them up. It seems there flow rate was poor. Plenty of other toilets though. But overall we really enjoy our stay at Mountain Lair and would probably return but would like to see a significant Internet connectivity improvement. It was Great .. House was perfect .. Fantastic Memorial Day weekend getaway! We had a great time leaving the kids behind for a Memorial Day weekend to celebrate my husband finishing up his master's program. The kitchen has everything you could possibly need (TWO of most things!) and we never ran short of plates, linens, or felt crowded. The only downside is the wi-fi is a little slow - might want to get a faster connection for streaming movies (it cut out several times). Overall, would absolutely stay here again. Thanks for taking time to complete the review survey. We appreciate the time. We are sorry you had difficulty streaming movies via WIFI. Our rural mountain area does not have super fast WIFI like more populated areas do. We do however have some incredibly beautiful night skies! For the passed 2 years we have stayed at Mountain Lair. We have been making a yearly trek to Timberline for over 20 years. This is our favorite house. There are 20 of us, with extra people who just come for the day to ski. The house is large enough to accommadate us all. With the three floors you would hardly know there were that many people there. The beds are comfortable, bathrooms are clean and the kitchen is to die for. The improvements in the kitchen since last year are amazing. The new stove with a griddle, 2 ovens, and large center island were perfect for cooking and preparing meals. Easy ski in and out access to slope. Perfect weekend. We will be back next year. We have been renting this house for 5 years and wouldn't dream of skipping a year. We go there in the winter and it is a ski in and ski out home. Most people go out for one or two runs, return to the home and then go out again. It's so convenient. It's also warm and inviting. The newly renovated kitchen is beautiful and you won't want for one piece of equipment for your cooking needs. The house is completely stocked with towels and linens. All you have to bring to this house is food, clothing and great family or friends. It's the best home I have rented and I have rented quite a few. BTW, the management team is second to none! We had a slight issue with the house and they took care of it in less than 2 hours. we loved the renovations in the kitchen. thrilled to have 2 ovens. was hard to feed 20 with 1 oven. Also loved the new hottub! We had a great Christmas party with brothers and sisters... left a small list of items I thought needed addressed but overall really enjoyed our stay. We felt four of the beds were to high for my older sisters to get into.. I went out and had to buy some step stools.. The Mountain Lair was a cozy meeting place for our group of 7 couples. There was lots of room to spread out and enjoy being together. We had a wonderful week with family for the 3rd consecutive year at this house. The house served our purposes well, the only exception is that the kitchen is small for 15 people but I hear that is being expanded. We reserved for next year. Also the leaves were at their peak and the weather was great. Our family of 15 adults, 3 children had a great stay at Mountain Lair! The house was a wonderful size and accommodated our needs very well. It was a beautiful house - plenty of room for 5 couples. The hot tube was very nice, the kitchen was well equipped (there were only 4 wine glasses). Four out of five couples did not like the beds (mattresses too high and uncomfortable). Beautiful, clean house. Good location. Had everything we needed. Plenty of towels. We had five families staying there and everyone felt they had their own space. We all loved it! We always have a wonderful time. This year the hot tub wasn't working correctly. We had to have maintenance come out but it still never got to hot. The coffee pots: 1 never really worked and the other one took about 45 minutes to brew. And also the grills didn't have enough propone to cook with. We only used the grills one night and one ran out half way so couples had to wait to use the other one. The propane has been an issue before so I don't know if its because we are coming at the end of the season and it hasn't been checked for the summer or what. We really appreciate the owner renting his home every year. This group has been together for almost 40 years and this is one of the most enjoyable times of the year we have together. Thank you again and we will be back next year. The house if very nice and laid out well. I was happy that it has the two refrigerators, however, there is only one oven and it's a miniture (27") so it was difficult to cook in there and we resorted to using the outside grill for some things. The electric griddle was also very helpful. Overall a very nice house for a big group. We have been coming to Timberline for about 20 years. This was the best house we've stayed in. It slept 20 people comfortably. The way the house is set up you can retreat to your bedroom and get away from all the noise that 20 people can bring. The kitchen was well equiped.Location on slope couldn't have been better. If I could improve one thing it would be the oven. If you put more than one casserole in, the oven had a hard time maintaining the temperature. Also the oven seamed small. Two ovens would have been fantastic. I have been coming to this house for about 5 years now and never once has it disappointed us. There is nothing lacking in the house, right down to a garlic press! I would highly recommend it. This house is awesome. There were 13 adults and 6 kids and never once did any of us feel cramped or the need to “escape” the confines of the house. In fact, the first full day we were there, none of us even left the house the entire day! Instead we spent it cooking, eating, playing music, watching movies, playing board games and sitting around laughing. With three floors and so many beds, plenty of bathrooms and a deck (which unfortunately was too cold for us to utilize this trip) there really is plenty of room for a large group. One minor suggestion would be to add a second oven. There are two refrigerators which is great, but when cooking for so many (and we made Thanksgiving food which means lots of oven time!) a second oven would definitely have been helpful. The views are pretty – there are neighbors close by though. We also went to Blackwater Falls State Park one day which was really pretty and a nice place for hiking around. We had a fire going in the fireplace the whole time which helped keep us toasty. We really appreciated having the house stocked with wood. The kids got a kick out of the pool table in the basement. The hot tub was broken when we got there but we called the repairman and he came the next day. Unfortunately it was the day we were leaving, so we didn’t get to test it out. Overall, two thumbs up! We've been renting houses as a group for 10 years and this is the best one yet! Thanks for a great place to stay. A family of 15 had a good week at this house. We lucked out with the leaf colors at their peak and plenty to do in the area. The only improvement would be a larger kitchen and dining area. awesome place, very roomy, great for guys weekend away with 10 bedrooms and separate baths, was well stocked with all the necessities, including propane, firewood, paper products, etc. We had a group of 18 stay at Mountain Liar. Everyone had an awesome time, sitting on the deck, in the hot tub and playing games. 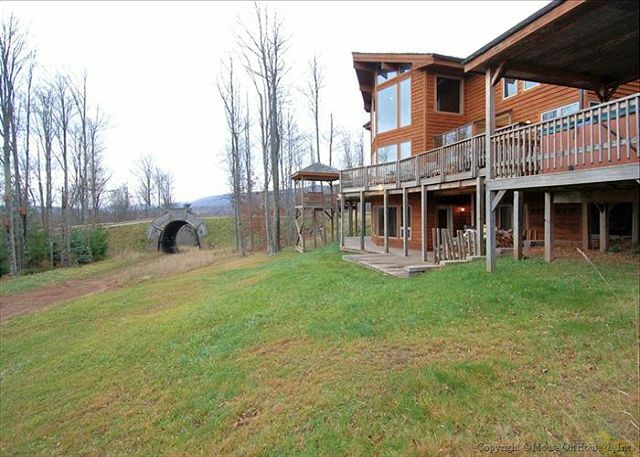 Would recommend this house to anyone headed to Canaan. Making plans for next year. Thanks everyone for your help! Mountain La is a great house and met our requirements completely. Our family party of sixteen stayed at Mountain Lair in late July. 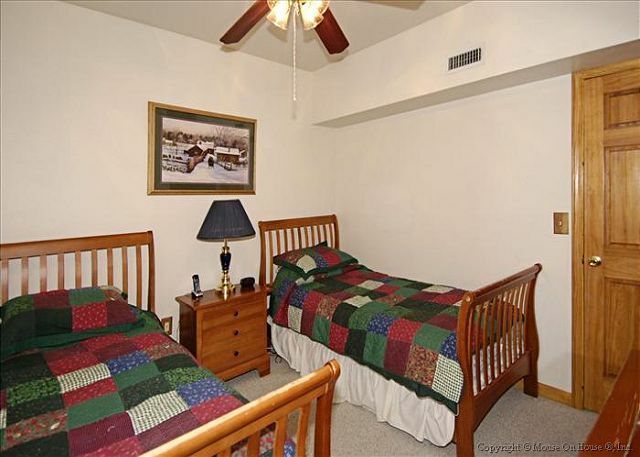 We were very comfortable in this spacious and well-appointed house, and we could have accommodated more. The bedrooms were all comfortable, many with private baths. It was nice having two bedrooms on the main floor for the 87-year-old elders in our group. Our youngest family, with small children, took over the downstairs area, except for the pool table which many of us enjoyed! Outside, we took full advantage of the extensive decks and the hot tub. And, as we had arrived in separate cars from several different points of origin, it was nice to have so much parking space. The house is in a development so is not 100% private, but the lots are a good size. It is in a central location for day trips to the state parks and other local attractions. The most popular outings in our group were hiking in Dolly Sods and visiting the small towns of Thomas and Davis. Though winter is considered the high season in Canaan Valley, we were very happy to have visited in summer. We cooked some meals at the house and ate out for others. Linda Spence of the White Grass Café catered a fabulous meal (I recommend her wholeheartedly), finishing up the preparations at the house. There seemed to b plenty of counter and refrigerator space. Tip: in the closets are a folding table and chairs to supplement the main dining table for ten. I would happily stay in this house again with a large party. We had a wonderful time in Calnaan Valley. We were in the valley for the CAWV Summer camp. The house was great. CAWV is short for Challenged Athletes of West Virginia. The camp that was put on was for Wounded Warriors and their families. We were some of the volunteers helping with the event. Will call you guy next year for this house. This is a huge house. Very neat and clean. It has all the essential utensils. Beautiful place. Loved staying here. No, it can't get any better. We will be renting this property again next year! We rent this huge house every year. It a wonderful home. It sleeps 24+ people and needs a larger hot tub and another oven. Otherwise - PERFECT!! Have been renting Mountain Lair over the past 4 years. Five families, 20 people in 10 bedrooms works well. The view of Winterset slope as it winds into the tunnel completes the ski-in/ski-out experience. Now if we could only move the house onto Twister or Dew Drop. Minor inconveniences would be the small kitchen, uneven oven and non-working blender. Also, the house could use better thermostats or zone heating as its too hot upstairs and too cold on the lower level. 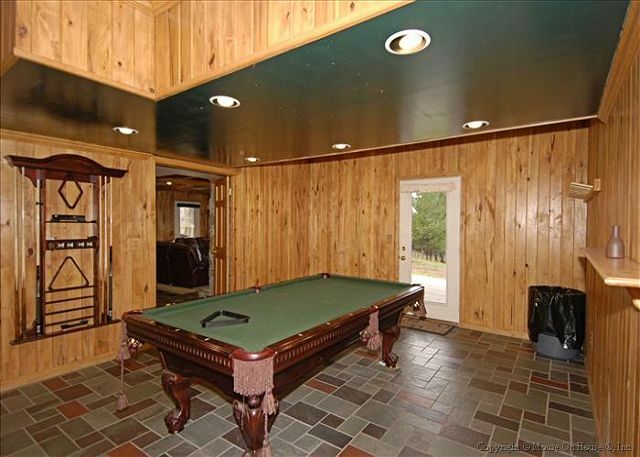 The billiard room now doubles as a mud room which is problematic. when the room is full of ski boots, jackets, gloves etc. However, these issues will not stop us from returning for a fifth year!! The house accommodated 20 people easily. The bedrooms were furnished very nicely and all rooms had flat screen TVs. It also has 8 bathrooms with 6 of them being in the Master Suites. My only comment was that the kitchen was not large enough compared to the size of the house, but it had everything we needed and then some. I would definitely recommend this home to anyone with a large group. We've stayed in this house 3 years in a row. our only complaint was no hottub and not being accessible to the house due to the slopes not being open. We hate to pay extra for prime location only to be faced with the same problems we would have if we stayed further away. dont know if you can put any more pressure on the resort to think about that. Overall still had a great weekend and we love the house. 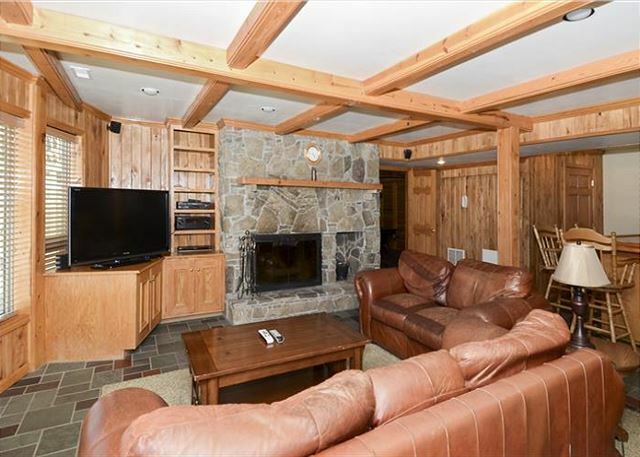 This property was great for an extended family getaway. The many bedrooms and bathrooms served us well. The kitchen and dining areas were a little tight but since we are family it worked okay. The leaves were at their peak and very colorful. we loved it ,it was a perfect get away. we have been doing it for four years in a roll, 2nd time at this house, only thing there were alot of spiders/webs. we will be back! The staff was wonderful. I informed them of a few problems shortly after we arrived, i.e. 2nd frig and hot tub not working. Before I knew someone was out and fixed both issues. The house accomodated 20 of us very comfortably. We loved the fact that there were bedrooms everywhere. Also very kid friendly. They had extra high chairs for all the little ones. Thank you. We truly enjoyed our trip! So much space in this house for lots of people. Love the fact that most bedrooms have their own private bath. Definitely plan to go every year! Awesome house but needs AC. we loved our stay at mountain lair, could not have been better. there were 17 of us and we could all have our own space if we wanted. close to many activities, horse back riding, white water rafting ski lift to the mountains, loved the purple fiddle great music. We have a wonderful time with friends. The home was set up very nice. It accommodated 20 adults. The kitchen although counter space limited it had everything we needed to be able to eat meals in. Everything was very neat and clean except the windows. Without air conditioning, which we didn't realize when we reserved, needed opened and a few of the window openers were broke. The biggest thing I would suggest is for the home to have chairs on the bottom deck. It was a beautiful four days and we wanted to take advantage of the lower deck but there were no chairs and the grass was so tall that it made it hard to play yard games. Also the lower deck vase was packed with cigarette butts which should have been cleaned. The house is wonderful. Beds are comfortable. Location is the BEST! Another oven would be good when cooking for 20. Great house for a group ski trip. 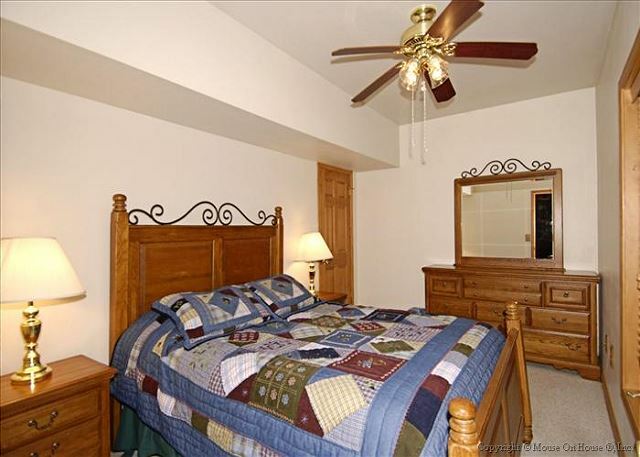 Location is fabulous and house is very comfortable (people were commenting on the beds and how well they slept). The one thing I'd like is to maybe have 1 other bedroom with more than 1 bed to accommodate more singles, but otherwise, it's great! And a really good value. It was absolutely perfect. We're looking forward to next year! Excellent location but not much snow. Skiers did get to ski on Salamander but we could not use the Winterset Trail. The home was large, clean, well-maintained, and very comfortable. We had a great family getaway. The weekend went by way too fast. The house was beautiful - inside and out. It was truly breathtaking. We have been coming to Canaan for years and this was the best place we have ever stayed in. We'll be back! My extended family of 30 spends one week together in a different location every summer - Mountain Lair (and Wind Landing) were perfect for us this year. Canaan Valley offers a great variety of things to do for all ages and interests. The folks at bestofcanaan were great (exception: the surly maintenance person). Mountain Lair bedrooms were comfortable, the common rooms were ample, the decks were awesome. Additional blinds to block the afternoon summer sun and ceiling fans in the kitchen and dining room would help to keep the house cooler; we shifted to the cooler lower level for games and pool in the afternoon, but those on kitchen detail would have appreciated the blinds and additional fans. One of the best things about the house is the horse trail behind it. Timberline Stables brings groups past the house a few times a day - Angie and her team at the stable are WONDERFUL - extremely knowledgable, careful and accommodating to our family whose ages range from 4 yrs old to "top of the scale" baby boomers. I highly recommend a trail ride with them - we rode twice! Also recommend taking a ride up to Thomas to the funky Purple Fiddle for a sandwich and some live music during your stay. Great location. Beautiful place. Small issue with grill being dirty but other than than, the place was WONDERFUL!! !Will be back..
We have been going to Timberline for 21 years. We have stayed in this house for 9+ years and LOVE it! House is great for large groups. Well equipped. Only suggestions: larger hot tub or 2 hot tubs and better grill. House is great, comfortable, not pretentious. One shower appeared to have not been cleaned (soap shards in the stall) but not a big deal. BIGGEST suggestion is a stepping stool or something for the hot tub. It's tall and very difficult to get in & out of; one person in our group slipped & fell on the ice getting out, and hurt herself pretty badly.